Like all of the books in the Simple Guide Books series, The Simple Guide to the Writing Process is written for the person who may struggle with this topic and the person who needs basic explanations with straightforward examples. The book helps students, parents, and professionals alike to achieve their goals of improving their writing efficiently. Getting ready to write an essay? Headed back to school and overwhelmed by projects and research papers? Want to help your teenager with a school essay but feel lost about giving advice? Have a local or state issue that you need to write a legislature about but are unsure of how to structure your thoughts? The Simple Guide to Thesis Statements and Support is a thorough guide for anyone getting ready to write. Returning to school? Helping a student? Wanting to write a letter, an essay, or an article? This is your resource. The book is written in an easy-to-understand manner so that anyone can read it and use the techniques to start writing today. As well, the book offers examples so that you see thesis statements and support in practice. See examples for: a blog post, persuasive editorial, narrative story, compare or contrast short answer, and research response. Few writers are masterful essayists when they start out. Writing and supporting a strong thesis statement takes time and practice. Many writers struggle with constructing a thesis and how to support one with valid information. Thesis statements are probably the most challenging elements of essay writing. In this book, we present the craft of thesis statements and their support in a simple, straightforward manner. The Simple Guide to Thesis Statements and Support can give you no matter what your writing task is and no matter what your writing ability is. If you can follow a simple guide, you will be writing today. Like all of the books in the Simple Guide Books series, The Simple Guide to Thesis Statements and Support is written for the person who may struggle with this topic and the person who needs basic explanations with straightforward examples. The book helps students, parents and professionals alike to achieve their goals of improving their writing efficiently. There is also an index between the sixth and seventh editions and examples of in-text citations and Works Cited pages. Most novice writers find the research process and style guides challenging. This book answers questions on researching and citing research sources in a simple, straightforward manner. Start into The Simple Guide to Using MLA for Research Papers right away to make your research paper successful. The Simple Guide to MLA for Research Papers covers MLA’s 7th edition. Is it time to reignite your creative spark and start writing again? Have you been thinking about writing but not sure where to begin? Paint & Ink takes readers on a creative journey using artwork and writing prompts to encourage creative ideas. All the prompts are directed towards women and women’s experiences. This is the perfect time to write and be creative. A terrific first step to awakening one’s creativity is to journal. By journaling, we allow ourselves to write, think, and feel without pressure to be perfect. We do not have to worry about constructing stories that will be published or even seen by others. While journaling, we can create the writing that will allow us to explore and experiment. When a person has not written or been creative in a while, journaling can be just the thing to reignite the creative spark. Rejuvenate. Revive. Rekindle the creative spark. Paint & Ink includes paintings, writing prompts, and references to literature and research to guide reader’s idea generation. The act of being creative is extraordinarily therapeutic. Many people feel better about themselves, their situations, and the world around them after they journal about a difficult scenario. And there is research to support that people who engage in creative pursuits enjoy life more. The activities in this book give women of all walks of life—mothers, maidens, single ladies, grandmothers, business powerhouses, and divas—a bit of guidance on the journey to incorporate creative writing into their lives. Paint & Ink contains everything you need to get started down the creative path. It is a journal so readers can jot down their writing onto its pages. Sofia was the smartest girl in school. Because she was so bright, school felt slow and boring to her. To escape the slowness of her days, she escaped into her books. Every day, she read as much as she could to enjoy the thrill of learning new skills, expanding her imagination, and discovering wondrous details about the world around her. Sofia is a story that captures a problem that many children face-boredom-and introduces them to the solution of reading books for learning and entertainment. All people face barriers and challenges in life, so teaching children how to apply positive solutions to their problems helps them to thrive. The book Sofia takes readers through how to escape life’s problems by jumping into the magic of a book. This book is a celebration of culture, history, art, and language. Sofia is written in English and Spanish. It features original paintings by Denver artist Colleen Hennessy. Every child loves animals but not every child knows the wonderful ways that animals improve our lives. Fran is a child who teaches others how to appreciate animals. While in town, Fran notices a group of kids rough housing in the street. A young boy with them shouts at and pulls his puppy too hard. Fran stops the boy and talks to him about how valuable animals are to our lives and how animals help people. Fran teaches the boy that his puppy can be his best friend if given the chance. The boy learns that animals are to be loved and cared for and that they make people’s lives a little bit better. The book Fran takes readers through many of the wonderful ways that animal help people. This book is a celebration of animals, children, art, and language. Fran is written in English and Spanish and features a non-gender specific character. It features original paintings by Denver artist Colleen Hennessy. Sometimes when we see people on television, we think we need to be like them with fancy houses, beautiful hair, or glamorous lives. But this is not true. The most important people are in our very neighborhoods. The teachers, farmers, coaches, parents, and friends around us are the most important people in the world. Trinidad realizes that the people living nearby are the valuable people in one’s life. The book Trinidad takes readers through the appreciation of the people most important in our lives. This book is a celebration of childhood, family, friends, art, and language. 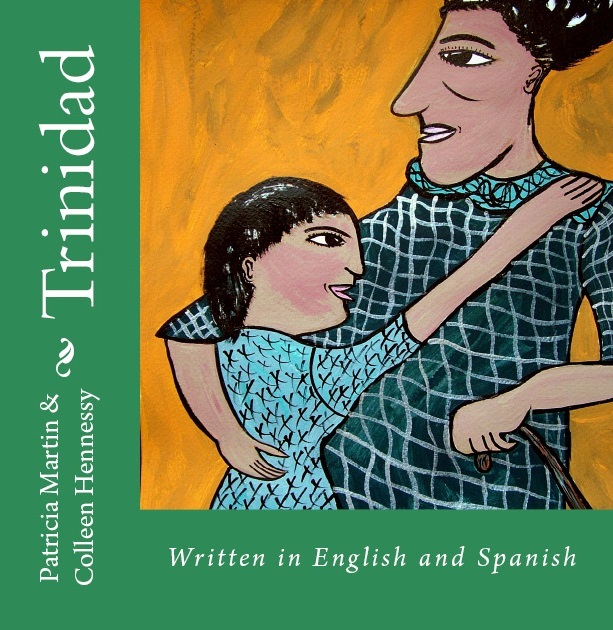 Trinidad is written in English and Spanish and features a non-gender specific character. It features original paintings by Denver artist Colleen Hennessy.